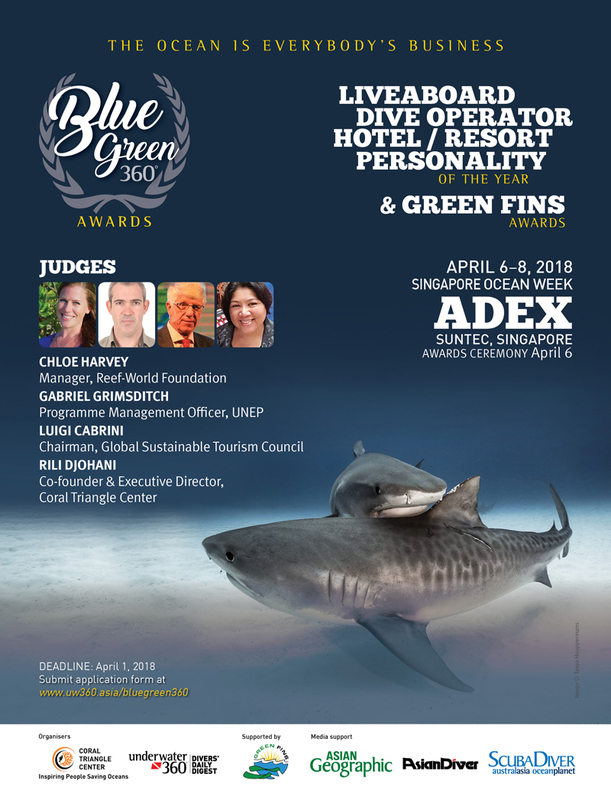 Singapore – Four businesses and one individual championing ocean protection conservation and sustainable business practices in the marine tourism industry were honored at Blue Green 360 Awards held on April 6, 2017 at this year’s Asia Dive Expo in Suntec City Singapore. Now on its second year, BlueGreen360 Awards celebrates businesses and individuals that are leading the way in implementing sustainable solutions in their day-to- day operations and sharing their knowledge and resources with the wider community. It also aims to highlight the value of healthy marine and coastal ecosystems to the industry. They winners were judged by sustainable tourism and marine conservation experts such as Luigi Cabrini, the Chairman of the Board of Directors of the Global Sustainable Tourism Council; Rili Djohani Executive Director of the Coral Triangle Center (CTC), Gabriel Grimsditch of the United Nations Environmental Programme; and Chloe Harvey of Reef-World Foundation, in collaboration with the organizers of the Asia Dive Expo. This year’s winners have all exhibited their commitment to environmental programs to protect marine biodiversity, successfully collaborated with various groups promote on-the ground marine conservation efforts that benefit the environment and the local community as well as become inspirations for others to do the same. Kurabesi Explorer Liveaboard operates as a social enterprise and is 100% owned by Indonesians and operated by a local crew. Kurabesi supports local culture as well environmental conservation activities in the areas where it operates such as in Raja Ampat and the Birds Head Seascape in West Papua, Indonesia. On the ground, Kurabesi supports several non-government organizations in conducting scientific reef health monitoring activities as well as work with a local foundation to conduct forest cover monitoring in coastal areas. Onboard, some of Kurabesi’s sustainability efforts include reducing plastic waste by providing refillable water bottles and bamboo straws to guests; ensuring that waste accumulated onboard are processed properly upon reaching land; introducing guests to conservation activities such as reef health monitoring; and encouraging guests to go to less visited areas and travel in small groups to minimize direct environmental impact. Ceningan Divers Resort ensures that all dive guests go over local regulations, are aware of the environmental practices in the resort, in its dive operations, as well as in the Nusa Penida Marine Protected Area where it operates. It conducts local community outreach and engagement programs which has led to the creation of a recycling program on the island. It supports non-government organizations conducting scientific research on mantas and molas and as well as regular reef health monitoring. In its operation, Ceningan Divers Resort has zero plastic products on site, uses non-chemical cleaning materials, use low-water technologies for its bathroom and toilet facilities, has a system to enable it to process and re-use its wastewater, and has onsite composting facilities. The resort has trained its entire staff on conservation, recycling, and composting. Reef Seen Divers Resort, located in Pemuteran in Northwest Bali, has several ongoing projects that directly support marine conservation activities such as the Reef Gardeners project which trains and creates jobs for young fishers to actively protect the coral reefs, a sea turtle conservation project, a cultural dance project for local school children; a reef restoration project through Biorock; and the establishment of a tourist fund to support local conservation activities. It also organizes a conservation week that brings together local community, dive operators, government and non-government organizations to discuss issues such as fisheries regulations, coral reef protection and marine conservation zoning plans. In its operations Reef Seen uses clean technology to process wastewater and solar panels to power its turtle and reef restoration programs. Evolution Diving Resort has achieved the #1 position amongst over 500 Green Fins members. Evolution has been Green Fins members since 2012 and each year they have shown a deepening commitment and measurable progress in reducing their environmental impact on the environment through the Green Fins assessment process. Now, in 2018, they have proven to have the lowest environmental impact of all Green Fins members globally. From working with the local community to raise awareness about marine debris to the strict enforcement of a no touch policy for every diver, Evolution’s team is exemplifying that sustainability and profit go hand-in- hand and protecting your primary business asset, the coral reefs, means protecting your business too. Nicolas Resimont is the Director of Nico Dives Cool, a dive shop based in Bali. He promotes the zero-waste lifestyle and aims to inspire others to do the same – from his dive guests, his employees and the local community. Frequent beach and underwater cleans up are part of his calendar every month while his team of local dive guides and dive masters are encouraged to do the same and he regularly trains them on how to respect and protect the ocean its marine life. For two hours the team will pick up the garbage on the beach. Nico explains to his staff them why we need to protect the environment, slow down our consumption of plastic and how to do so and trains them on how to act in the ocean towards marine life and provide coral safe and organic sunscreen to his staff and clients. In his business, he uses natural cleaning products, non-plastic packaged lunch box and no single use water bottles to show the right example to the local community and tourists coming to dive with him. The business nominees were reviewed on how they maximize benefits and add value to marine biodiversity and coastal environment, adopt innovative means to minimize negative impact to marine and coastal environments, actively engage communities in sustainable marine tourism, and adopt sustainable environmental practices in its operations. The individual winner was reviewed based on pioneering efforts in promoting sustainable marine tourism in the private sector and mobilization of various stakeholders in promoting sustainable business practices. On the other hand, Green Fins Award honors the top Green Fins member who has most effectively aligned their entire business strategy towards the protection of coral reefs. Hundreds of environmentally conscious dive and snorkel centers throughout popular reef tourism destinations in Asia received thorough environmental performance assessments of their everyday business. By highlighting businesses who value sustainability, the Blue Green 360 awards will help to promote those people who are going about business in the right way, bringing them more customers and more success. Asia Dive Expo (ADEX) is the longest running and the largest dive expo in Asia celebrating its 22nd year in 2017. A must-attend event for anyone interested or involved in the world of diving, the event has seen a continuous increase in visitors over the past few years, with ADEX 2017 attracted a total of 60,296 visitors over three days. Taking place from April 6 – 8, 2018 ADEX 2018 proudly presents world-renowned marine life artists, conservationists and photographers to speak about their passion and work towards marine life. It is organized by Underwater360 (UW360), and is an event being endorsed by major organizations in the industry such as DEMA (USA), the Singapore Tourism Board (STB) and the Singapore Underwater Federation (SUF). www.adex.asia. Green Fins is paving the way to unite politics and sustainability for marine conservation at diving popular diving destinations around the world. Established through a partnership between the United Nations Environment Programme and The Reef-World Foundation in 2004, Green Fins uses a unique and proven three-pronged approach; green certifications of dive centres, strengthening regulations and environmental education for dive staff, divers and government. Almost 500 dive and snorkel operators across seven countries have signed up for free membership, and are using Green Fins as a platform to set examples of sustainable business operations. To find them and to find out how you can dive your way to a more sustainable future, visit www.greenfins.net. BlueGreen360 Awards Year 2 celebrates businesses and individuals in the marine tourism industry dedicated to inspiring and championing sustainable solutions in their day-to-day operations and sharing their invaluable knowledge with the wider community. There will be one individual awarded as “BlueGreen360 Personality of the Year” for outstanding and pioneering contribution from an individual from the private sector to the promotion of sustainable practices in the marine tourism industry. The Green Fins Award is a featured award category which will be presented to the Green Fins Dive Center with the lowest environmental impact, as demonstrated by an assessment of business practice conducted within the last 18 months. Green Fins members will be automatically put forwards for this award and are not required to enter. For dive operators: every diver that you certify will be given a free one year subscription to either Asian Diver or Scuba Magazines. The Award is a platform to highlight businesses and individuals that have championed sustainable marine tourism best practices and made significant impact on the protection and conservation of marine ecosystems. Promote best practices in sustainable marine tourism through awareness creation and implementation by relevant stakeholders. Replicate sustainable marine tourism practices. Highlight the value and importance of healthy marine and coastal ecosystems to marine tourism. Interested participants can submit the application form here. Each application form will require submission of 2 reference names for validation. Each entry can enter in one category only. Members of Trade360 VIP Corporate Membership and ADEX 2018 Exhibitors can enter for free. Non-members and non-ADEX exhibitors can pay SDG100 to enter the award. Green Fins members will be entered automatically for the Green Fins Award but can also apply for the other categories. Interested participants can submit the nomination form here. Each nomination will require submission of 2 reference names. The criteria for businesses are based on the Global Sustainable Tourism Council (GSTC) standards for Hotels and Tour Operators and adapted to focus on marine and coastal environments. Adopt sustainable environmental practices in its operations i.e. compliance with local environmental laws, zoning requirements related to protected areas, and provide regular training and guidance for personnel to ensure compliance with environmental regulations in the area of operation. Actively engage communities in sustainable marine tourism i.e. conduct awareness, outreach activities on marine conservation for local community members, work with community leaders in promoting marine conservation projects in the area of operation, provide opportunity for community members to economically participate in sustainable marine tourism through employment or the sale of sustainable products. Adopt innovative means to minimize negative impact to marine and coastal environments i.e. use of innovative technologies in power generation and reduction of carbon footprint, ensure proper solid waste and wastewater management, implementation of various ways to reduce pollution from business operations. i.e. active protection of marine biodiversity through initiatives and projects in the field, strict compliance of international and local codes of conduct in wildlife interaction, engage customers in marine and coastal conservation activities and projects. Pioneering efforts in promoting sustainable marine tourism in the private sector. Mobilized various stakeholders in promoting sustainable business practices. Recognized in the public domain for promoting sustainable marine tourism practices. A participation fee of SGD 100 will be charged for businesses who will join in order to cover part of the administration costs and costs of trophies. All ADEX Singapore 2018 Exhibitors are exempted from the fees. Members of Trade360 Corporate VIP Membership are exempted from the fees. There will be no cost to nominate participants for the individual award category. Green Fins members are automatically entered in the Green Fins awards.